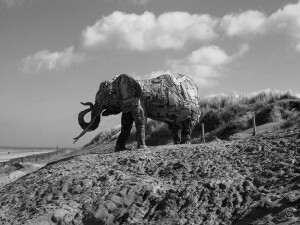 The elephant is a metaphor that awakens the yearning for forgotten conversations between humans, the Earth and all living things … we made these life-size elephants out of recycled materials … they represent the world of nature from which we have removed ourselves and for which we increasingly yearn. The elephant is the largest land mammal and thus a symbol of the threat of our ever increasing industrial and commercial development to life on Earth. The elephant is strong and powerful yet also very vulnerable. Elephants and human beings share many characteristics and traits. They both have a highly developed sensibility, a deep-rooted attachment to family, and similar emotional responses. The Human Elephant Foundation tries to reignite and keep alive the relationship between humans and nature that has been lost, and to encourage everyone to do something meaningful with his or her life. It initiates and facilitates discussion and innovative problem-solving for a more respectful and sustainable world. It aims to bring individuals and businesses together to stimulate their imagination and creativity: the huge problems we face, as this report shows, require the ability and desire to break new ground and generate fresh ideas. Life-size elephants, made out of recycled materials in different regions of the world, could help mobilise communities to get involved in broader human and environmental issues. The artist and creator of the elephants featured in this report, Andries Botha, lives and works in Durban, KwaZulu-Natal, South Africa. He is very conscious of the fragile coexistence of people with other forms of life, and has tried to unravel the mystery and responsibilities of living alongside plants and animals. This led to the formation of the Human Elephant Foundation in 2006.